"We are only a nation by virtue of the Torah." In June of this year, Israel’s Knesset instituted a new holiday with the none-too-inspiring name “Aliyah Day”, designed to commemorate and highlight the role of immigration in the making of the state. Israeli public schools are planning to teach students about the role of immigrants in the building of their nation and the Knesset will be holding special meetings to discuss aliyah’s role in further strengthening the country through new citizens (read: human shields). The Knesset instituted the holiday on the seventh of the Hebrew month of Cheshvan, coinciding with the reading of the Torah portion in which Abraham is told to leave his home to go to what is now Israel. Requisitioning Judaism’s spiritual property for political gain is nothing new amongst Zionists: Israel has been doing so since it’s inception as a nation, pushing their political, nationalistic agenda under the guise of uniting the Jewish people. In all truth, they have no basis for doing so, religious Jews believe that the land of Israel does not currently belong to our people as we are in a spiritual exile from the land. Using this language to gull Jews into participating in the construction of their “paradise” is well-worn path amongst the architects of the State of Israel, being used to goad the unsuspecting into immigrating under the pretense that Israel’s founding somehow represents the first spark of the end of Exile. This, in addition to the use of a Torah portion which, to the uninitiated, appears tailor made to their purposes, and we have what could only be described as propaganda gold. Achieving something like replacing authentic Jewish identity with a purely racial and national self-image could only be accomplished through cloaking their true intentions in thinly veiled metaphors. Without them their message would be barely palatable. The truth behind Israel’s ambitions is somewhat more mundane. In today’s world, the majority is automatically seen as having the moral high ground and when Israel can lay claim to possessing the “overwhelming majority” of World Jewry, their statements suddenly have a more authentic ring to them. Now, their words inexplicably carry weight in the court of public opinion in regards to all things Jewish. What sort of reputation would their nascent state have if it was barely populated? As Jabotinsky and others saw from the outset, they had to find a solution to the overall lack of enthusiasm for their movement as quickly as possible. A nation has to be populated and, being resourceful fellows, they came up with a plan in short order. The tactic was a relatively simply one: foment discord and stoke the fires of Anti-Semitism in the Diaspora be it through the press, protests designed to antagonize the Gentile public, bombings or any one of dozens of other methods. Then wait for the almost inevitable backlash against the majority of the uninvolved Jewish community and, when the smoke has cleared, open the doors of immigration for the harried and traumatized masses, wherever they may come from. The hidden instigators would then play the role of open saviors, spreading out their arms in “brotherly love” towards the survivors who, having lived through a whirlwind of violence, were thoroughly convinced that they (the Zionists) were right: the only safe place for Jews was the “Jewish” State. Frequently this entire process was and is accompanied by phraseology evoking the religious language of the Jewish people; twisting and falsifying Torah sources in an attempt to transform “Jews” to “Israelis”, subtly coaxing immigrants to abandon their faith for the betterment of the nation. The irony of using religious imagery is especially stark considering that literally tens of thousands of these “rescued” olim were forcefully torn from Judaism upon their arrival to the Promised Land. Others were compelled to reject their heritage for a more secular outlook through more subtle means, but the results were the same. Consider the statement made by then prominent Italian Zionist Enzo Sereni in 1935 at the 19th World Zionist Congress in Lucerne, Switzerland, saying that, “We have nothing to be ashamed of in the fact that we used the persecution of the Jews in Germany for the building up of Palestine.” This routine rehashed itself in tens of countries, from Germany and France to Iraq and Yemen, thus emptying out ancient communities in order to improve “Israel’s” image on the international stage. Despite the passage of time the techniques haven’t changed, most recently being utilized to kickstart French immigration. However, the world is a much smaller place than in 1948 and today’s would-be immigrants are sitting up and taking notice of the dismal situation that awaits them in “Israel” and are exploring other options available to them. 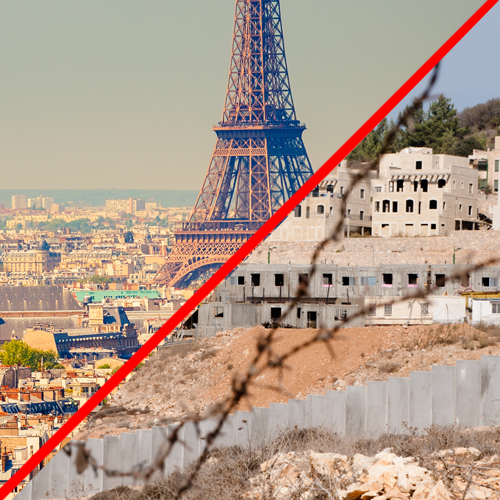 The number of Jews making Aliya from France has been on a steady decline, expected to decrease from 8,000 immigrants in 2015 to almost half that figure in 2016. Qualita and other organizations are “deeply concerned” over the decline in immigration numbers, advocating a greater show of regard for the well-being of new immigrants as a way to stem the tide. They forget that the immigrants are more than just numbers but people who’s goals in life go further than strengthening Israel’s natonmistic identity. Qualita’s Ariel Kandel expressed his concerns over dipping aliyah rates by saying, “If the situation does not change, the State of Israel will continue to lose many immigrants to other countries which offer better absorption conditions, and we will all lose out.” You, Mr. Kandel, may lose out but the immigrants certainly will not. True Torah Jews hopes that the plethora of information available concerning the often negative consequences of aliyah and will see past “Israel’s” glitzy PR campaign of propaganda for what it truly is: a desperate attempt to squash Jewish religion and heritage for a more nationalistic agenda.